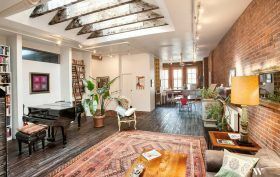 This two-bedroom loft six floors above a cobblestoned Soho street may just be the perfect downtown spot to call home for an extended visit to New York City. The short-term rental, available beginning in December through January 15th, is right smack in the middle of the city’s chicest shopping zone, but is enough floors up to get peace and quiet, great light, and a chance to enjoy the quintessential loft interiors that come with the 1870 building. Also, your holiday HQ at 108 Wooster Street, asking $10,000, comes fully furnished: You’ve been warned.